Sand bags at the ready! I have been pursuing this problem for a couple of months, following resident complaints and raised it at the February meeting of the East Parishes Area Committee as did Cllr. Bruce Hubbard. We have thought for some time that surface water flowing off the site where the new prison was to have been built could be the cause and recent heavy rain has confirmed this is at least a contributory factor. 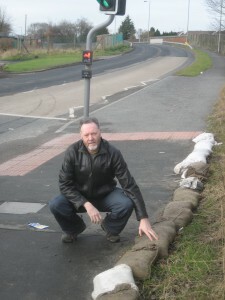 Indeed, some sand bags have had to be placed around the pedestrian crossing to help to control the water. I posted about this historic site late last year. 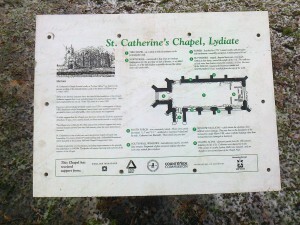 Well, the interpretation board has been replaced although someone sneaked the new one in without telling me! Indeed, it was local business man Les who told me that my quest had already been completed without my realising. Thanks Les, I owe you one. The Leader of Sefton Council put down what looked to me very much like a clear marker at the Maghull Town Council meeting last week and it was a marker that will not go down well with Green Belt campaigners. Labour Councillor Peter Dowd, who I have known for many years and on a personal level get along with, told the Town Council (which he isalso a member of) that in relation to future house building he was very much of the view that some of it would be built on land that is Green Belt. He was clearly trying to put a message across and I must admit that I wondered who Peter was really speaking to. He did not make his remarks in a party political way what so ever, indeed he seemed keen to ensure that no one thought he was doing so. But the more I have pondered on what he said the more I have wondered if the message was meant for his own followers and indeed the Sefton Central Labour MP. I say this in the context of Labour doing some pretty outlandish things in relation to the Green Belt in recent times. My posting of the 11th of February refers. I have known Peter long enough to realise that what he said was said with a purpose. Following the recent case where a young child was pulled out of cot by a fox there has been much media hype over the matter. Urban foxes have been around for a long, long time. Indeed, I recall sitting at the busy A59/Hall Lane traffic lights by Maghull Town Hall not so long ago and watching a fox, bold as you like, trot across the A59. That was about 8.00pm in the evening. I also saw one where my Mum and dad used to live in Sefton Lane, Maghull making its way through back gardens. This was 4 or 5 years ago at least and my Dad would often tell me that he had seen a fox in his garden going back many years. Yesterday, at work, we got talking about this and a lady who lives in Melling told me that she often sees foxes about. But if you think about it the East Parishes part of Sefton is semi-rural so finding foxes in our communities is hardly a new thing. SAVE OUR GREEN BELT – Labour hype about Green Belt/Green Spaces – what brass neck! I mentioned not so long ago a Labour publication that is doing the rounds in the Sefton Central constituency called Sefton Voice and the frankly ludicrous article about the closure of Sefton Council’s libraries which is being pursued by the Labour run Council. But there was another but this time more subtle attempt to spin a bit recent history. In an article about the Green Belt we see a picture of three Labour councillors who represent Maghull walking across a green space. The impression that Labour wants us to pick up from this is that they are fighting for Green Belt and green spaces. The other picture shows Sefton Central’s Labour MP and his 3 Formby Labour councillors. Again a pro-Green Belt impression is being pushed yet the independent Green Belt campaign group in Formby seems highly unimpressed with what all 6 of Formby’s Borough Councillors (there are two Tories and one Independent in addition to the 3 Labour councillors) are doing to protect their Green Belt. If we cast our minds back to two quite recent events, one in Lydiate and one in Maghull the actions of Labour, as opposed to their spin, has not been as ‘green’ as that Party seems to think we are. In Lydiate, Labour councillors on Sefton Council’s Planning Committee voted to build a canal marina on Green Belt land. The only reason it did not happen is because at that time Labour did not control the Council and opposition parties voted together to stop it. 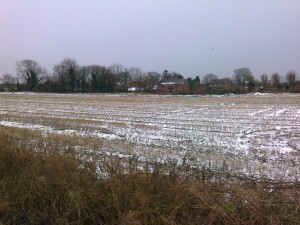 It then went to a Planning Appeal where the developer tried to overturn the Council decision. No Labour councillors turned up at the two day hearing and it was left to residents and Lib Dem councillors to fight the developer. 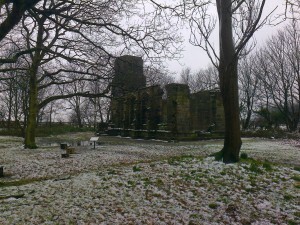 The battle was won but under Labour the planning permission would seemingly have been given. In Maghull, Labour brought residents together to fight a development on a significant piece of urban green space in the heart of the community, off Damfield Lane. Labour brazenly marched them up to the top of the hill and then abandoned them by voting for the planning application! The more they spin the more they expose their ‘say one thing do another’ approach. Oh and by the way, in case you may be thinking that I would be saying this because I am in opposition to Labour, consider this. A lady, who said she was a Labour Party member, got up to denounce the actions of Labour at a Planning Committee meeting that dealt with the Damfield Lane project; I know because I was there! A few years ago a ‘Best Value’study was undertaken on the maintenance of Maghull’s parks and gardens and it found that our many areas of public green space are a significant asset to the community and they are a big factor in why Maghull is such popular place to live. In recent years the former Lib Dem administration on the Town Council embarked on a second programme of upgrading children’s play areas in particular (of which there are now 11 across Maghull’s parks) following the very significant upgrade programme of the late 1980’s and through the 1990’s. As with many things the life cycle of play equipment is finite and new more exciting play items come onto the market. have seen considerable investment from the Town Council’s own funds but also via the Playbuilder Government funded grants. Other individual items of play equipment have been replaced across the parks as they have become life expired. Skateboard facility – We are also aware of the long held view of young people, as expressed to the Council via Maghull & District Youth Council, for the Town Council to try to facilitate the provision of a local skateboard facility. We are pleased that this wish is being seriously investigated and hope that options will be presented to the Town Council in the near future. Sefton Sudell Ward Cllr. Cliff Mainey has assisted in bringing in some Section 106 money (planning gain money) from a development off Station Road Maghull to enable cash from that source to be used to further upgrade Maghull’s play areas. Green Flag– With regard to the Town Council’s parks and gardens we would like to see ‘Green Flag’ opportunities developed, firstly at KGV Park, where such a project was shelved due to the building of Meadows Leisure Centre, and then to bring in other Maghull parks for Green Flag entries/awards. Our proposals are therefore to encourage the new administration of Maghull Town Council to both continue and develop the established investment programme in the Town’s parks and play areas and we hope that proposals can be brought before the Council for discussion as soon as possible. Maghull TC has a history of investing in the environment via Maghull in Bloom, Maghull Station Volunteersetc. It was probably all started by former Town Councillor John Sharman’s Whinney Brook Volunteers many years ago. The Dell– This piece of land at the junction of Westway and Liverpool Road North is in the hands of the Primary care Trust (NHS) and the Town Council tried to get The Dell passed over to it a few years ago. The NHS was not keen on doing this and said they wanted to await the potential redevelopment of their neighbouring Health Centre. A number of years have gone by sine then but it looks like that promised redevelopment is now firmly back on the table. On that basis the Town Council needs to campaign for the future of this green lung at the heart of the Town. It is vital that it is not lost and the most likely way of making it secure is for the land to become the direct responsibility of the Town Council as originally intended. Without such a move the land may well be saved from development but the maintenance of it will continue to be at a very basic level. We call upon the Town Council to take up this challenge once again. Land fronting Royal Mail Sorting Office– This Liverpool Road North plot was adopted by Sefton Council many years ago and it remains a poor advert for the Town as the maintenance is inadequate yet the site, like The Dell, is very prominent. The Town Council agreed to fund the landscaping of this site some time ago but the project was shelved pending possible redevelopment of the site. That redevelopment is not now going to happen so the Town Council’s investment in the land can be taken forward. As well as investment from the Town Council both the above sites may well be able to benefit from S106 (planning gain) monies that will be available because of development plans for Maghull Shopping Centre. We call upon the Town Council to take a lead here to ensure these two prominent environmental projects are followed through in line with previous decisions made by the Town Council. We wish to encourage the new Town Council administration to take on board these environmental and play area projects as both will assist with and complement the efforts of the Maghull in Bloom and Station Volunteer groups as well as presenting the Town in a better light to both residents and visitors. We appreciate that large investment programmes such as the ones we propose can only be sensibly addressed over a number of years but the commitment to pursue them is vital if the Town Council is going to lead the Town towards a better and more sustainable environment for the future.